This is the first hummus I’ve made at home that leans heavily on the tahini and nixes the olive oil (except as a garnish). I find the nutty tang of the tahini pairs well with the earthiness of the beet and the roasted garlic (which is quite mellow in flavor – despite there being a whole head of it, as the act of roasting tones its flavor down considerably compared with when it’s raw). What else am I digging about this Roasted Garlic and Beet Hummus? In my book, it’s solidly in the Healthy Snack Zone, being a totally nutritious source of protein, fiber, and plant-based fats – especially when enjoyed as a dip for crunchy veggies (though I’d be lying if I claimed to not wholeheartedly adore it with fried pita chips, too). Celery and carrot sticks (as pictured in the photo above) are popular veggie accoutrements to hummus. They are of course fab, but I’ve found that I especially enjoy sliced bell peppers with this Roasted Garlic and Beet Hummus; their slight sweetness, paired with their irresistible crunch, makes me (almost) forget that I’m not dipping with chips or pita bread or something else inherently-delicious-yet-downright-carb-y. 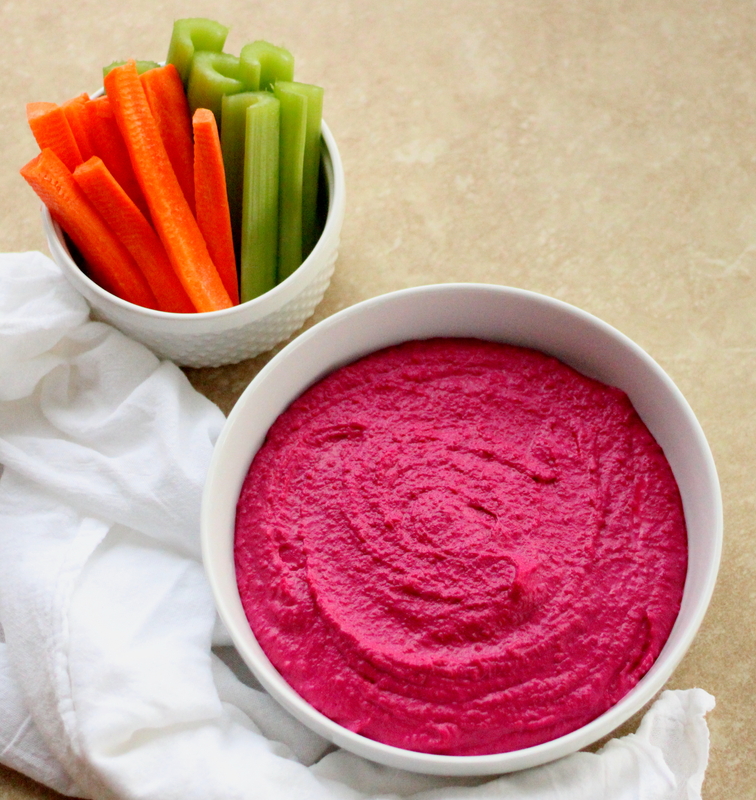 This Roasted Garlic and Beet Hummus recipe yields a large batch, making it an ideal serving size for a large gathering. OR, you can make it expressly for your household to keep all week in the fridge as a healthy-snack option to be enjoyed by you and the whole family. Now it’s time for my favorite part: the on-to-the-recipe part [cue me squealing excitedly]. So . . . ON TO THE RECIPE! What's better than homemade hummus? Homemade hummus that's ALSO bright pink, of course! Already cooked, canned chickpeas can be used for this recipe rather than dried chickpeas that need to be soaked. Removing the skins from the chickpeas makes for a more smooth-blending hummus, but it's not necessary; the hummus will still be yummy if this step is skipped. Add dried chickpeas to a bowl and cover generously with water. Add a tiny pinch of baking soda to the bowl and let soak overnight, or at least eight hours (the baking soda will help to loosen the skins from the chickpeas, making them easier to remove). Preheat oven to 400 degrees. Cut the very top of the head of garlic off, then drizzle with the grapeseed oil and wrap in aluminum foil. Wrap beet in aluminum foil. Place both on a baking sheet and let roast until beet is softened enough that it's pierced easily with a fork, about 60 minutes. Let both cool, then rub the skin off of the beet and slice into chunks; squeeze each roasted clove of garlic out of the skins. Set aside. Drain and rinse the chickpeas once they have soaked sufficiently. Add them to a boiling pot of water with a tiny pinch of baking soda (I learned the hard way that any more than a legit pinch of baking soda will turn the chickpeas to complete mush! ), reduce the heat to a simmer, and let cook until softened, about one hour. Drain and rinse the chickpeas. If removing the skins from them, let them cool first. Then one by one, remove the skins that didn't already come off during cooking (they should rub off easily). 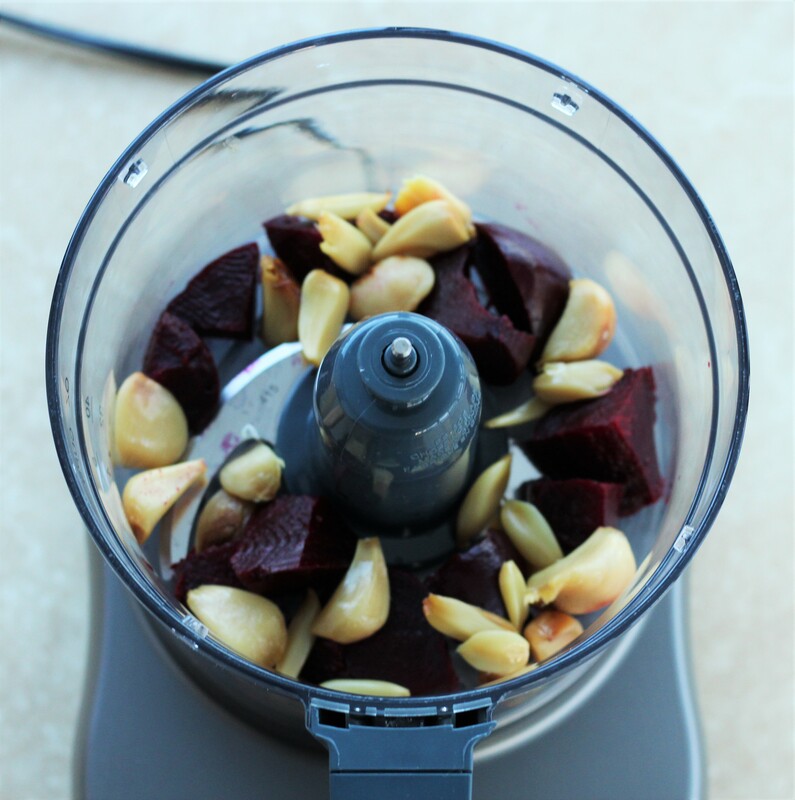 To a food processor or blender, add the chopped beet, roasted garlic, and cooked, skinned chickpeas. Process until combined, then add the tahini, lemon juice, water, and salt. Blend until smooth. If hummus is thicker than you'd like, try adding additional water, one tablespoon at a time, until the desired consistency. Garnish with a drizzle of olive oil and serve with sliced raw veggies, pita rounds, or chips. 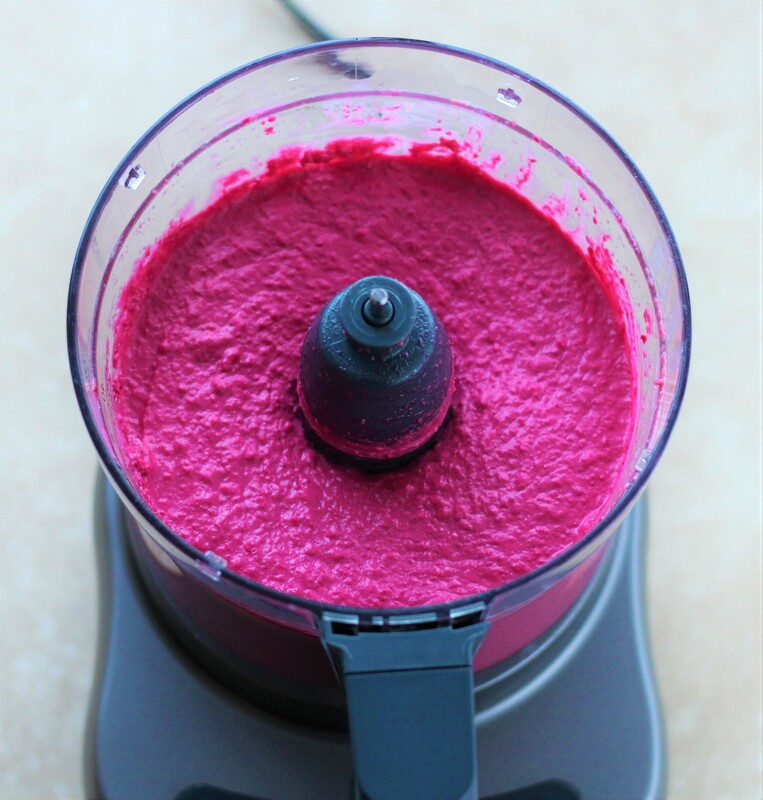 Now you're ready to savor the creamy, earthy perfection of your freshly-made Roasted Garlic and Beet Hummus!